Emily Salja wins the 2019 Settlement Language Resource Award, with a value of $3000. Emily will use her award for her project ‘LGBTQ+ Resources for Newcomers to Canada’. She plans to produce a 2-3 hour workshop introducing Canadian laws and expectations around LGBTQ+ individuals and communities to newcomers to Canada. The workshop will focus on how newcomers can practically engage with others without assuming gender or relationship status. Resources will be developed primarily for CLB 4 learners but will also include notes that can be adapted for CLB 3-6 learners and for online instruction. Resources will be available on the Tutela website (www.tutela.ca) and will include downloadable PDF document handouts, a slide presentation, and a PDF manual for teachers. Pramod Sah has won this year’s Mary Ashworth Scholarship, valued at $1000. Pramod will use the scholarship to travel to the 2019 TESOL International Convention in Atlanta, Georgia where he will present a paper related to his graduate studies titled Translanguaging in English-Medium Instruction (EMI) Classrooms in Nepal as well as Neoliberal Language Policy as Cultural Reproduction. Pramod will share his research at the 2019 BC TEAL Conference and/or write an article for the BC TEAL Journal. The 2019 BC TEAL Conference Committee has been awarded a Project Funding Award, valued at $2500, to support the cost of providing three internationally recognized keynote speakers for the 2019 BC TEAL Conference. This annual conference attracts over 350 English language professionals and features two full days of professional development featuring presentations, workshops, panel discussions, networking events, and publishers’ displays, as well as three outstanding international plenary speakers. Daniel Marc Jones has been awarded the Nan Poliakoff Memorial Award, valued at $750. Daniel Marc will use his award to develop innovative English language learning materials and to conduct research related to game-based language teaching (GBLT). His goal is to examine the challenges of implementing game-based learning and to find new and innovative ways to use GBLT in English language classrooms. Daniel Marc will present a workshop at the 2019 BC TEAL Conference. Pacific Immigrant Resources Society (PIRS) has been awarded a Project Funding Award, valued at $2500, for their project, EAL for Newcomer Parents. PIRS will use the award to further develop their EAL for Newcomer Parents curriculum. They will also offer the curriculum and guide to settlement service agencies, neighbourhood houses, and community-based EAL programs that teach parenting in a Canadian context. The curriculum will focus on English language and intercultural competencies for parents and caregivers at a language level of CLB 3-4 or higher. The goal is to enable parents and caregivers to feel more engaged and to have better access to their children’s schools and community. The curriculum, guide, and teaching/learning resources will be available on the BC TEAL and PIRS websites. A workshop providing an overview of the project will be presented at the 2019 BC TEAL Conference. 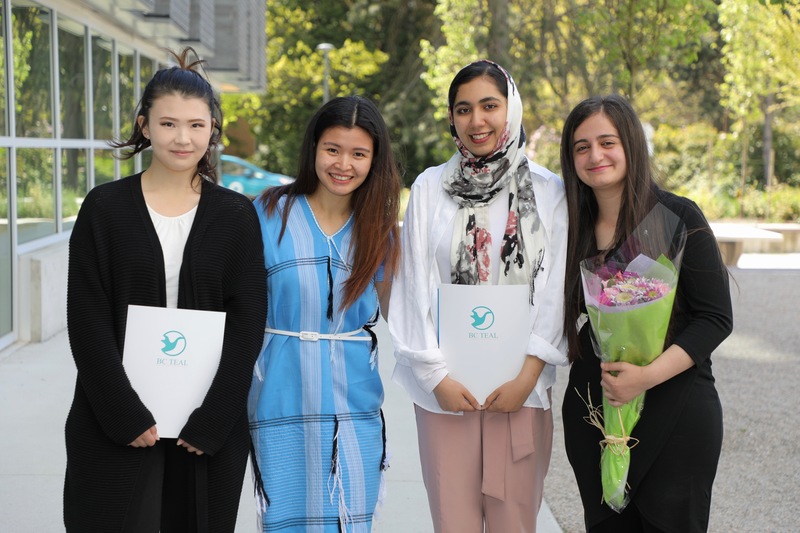 Andrea Solnes and Diana Jeffries have been awarded this year’s Health Education Award, valued at $4000, for their project, Refugee Men’s Health: Guided Pilot and Workshops for EAL Instructors and Facilitators. The project will address the needs of refugee men and their barriers to physical and mental wellness. The pair will also prepare and present workshops to support EAL instructors and facilitators to help and support refugee men to achieve better physical and mental health and improve their overall sense of well-being. The results of this project will be shared at the 2019 BC TEAL Conference and in the BC TEAL Journal. Julie Schiller-Birch has won the BC TEAL/TESOL Award, valued at $1000. Julie is an instructor and teacher trainer in the English Language Department at Okanagan College, and recently co-chaired the BC TEAL Regional Conference in Kelowna. Julie will use her award to attend the 2019 BC TEAL Conference in an effort to enhance her personal professional development and growth as an EAL and TESL educator. Julie will share her professional development experience with her colleagues at Okanagan College and write an article for the BC TEAL Newsletter. Calisto Mudzingwa has been awarded this year’s Pat Wakefield Scholarship, valued at $3000. Calisto will use his award to conduct research that compares the Language Instruction for Newcomers to Canada (LINC) program with the Australian Adult Migrant English Program (AMEP). He has posed two research questions: What are the similarities and differences between the LINC program in Canada and the AMEP in Australia? and What can those involved with the LINC and the AMEP programs, such as government departments, service providers, and researchers learn from each other? It is hoped that this research will inspire cross-pollination of ideas between the relevant government departments in Canada and Australia. Calisto will share his research findings at the 2019 BC TEAL Conference and submit an article to the BC TEAL Journal.